This is not originally my idea, I have seen Alternators grafted onto many different vehicles over the years. 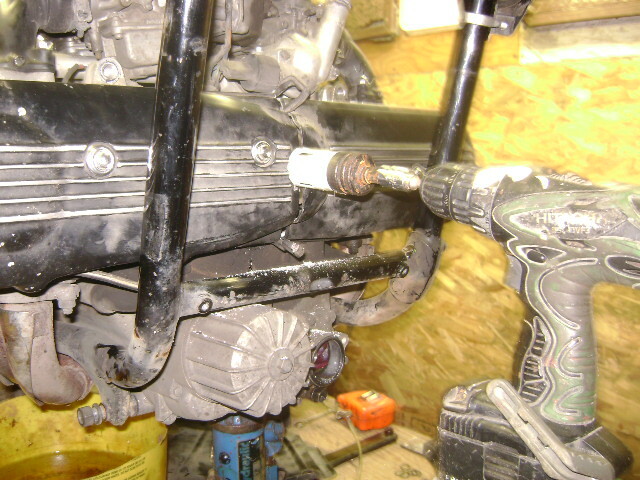 I was not happy with the limited electrical power of the stock charging system of my 82 GL1100 Aspencade. When I realized the limitations of the GL1100 charging system I went looking for ideas. I did a little searching of the internet for info, I found several references to the “poorboy” kit. I wanted to know what it looked like so that I might be able to build my own. 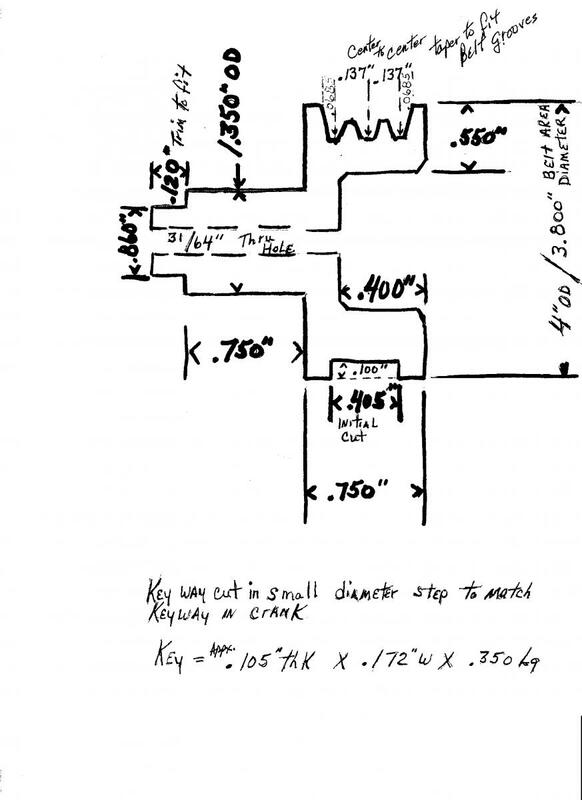 At the time I just gathered the info I needed to build what I thought might work without keeping track of where I got the info or who’s idea it was. After all I was only going to build the one for myself. (edited)Don “Poorboy” Pigott came up with a kit that fit the GL1200 , this kit does not work with the GL1100. 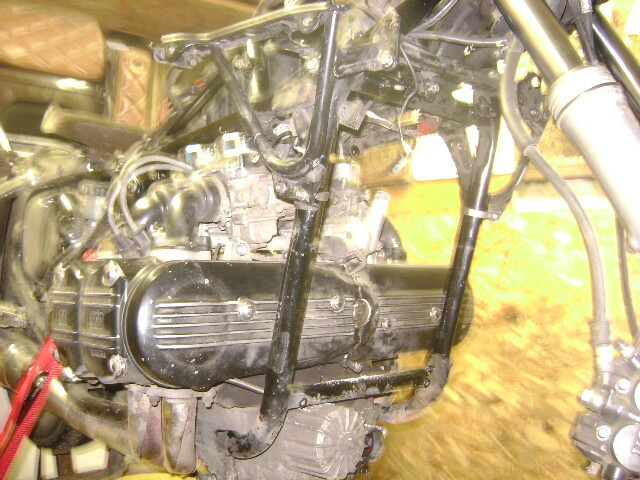 Some of the info I got was from Dan Filipi over at Naked Goldwings.com , who did this to his 83 GL1100. My thanks go out to these two men for their pioneering efforts. It took me many hours to come up with solutions to MANY little issues. If you do this conversion yourself,even following my method you will see what I mean. This is a guide to do it yourself NOT a guaranteed Step by Step (insert legal disclaimer here). Is it worth it? You bet it is ,I have more electrical power than I can use now. Like running the heated vest,grips,stereo,highbeam headlight,two 50 watt driving lights,two 55 watt ditch lights,cig lighter,trailer with electric cooler ALL AT THE SAME TIME!!!! 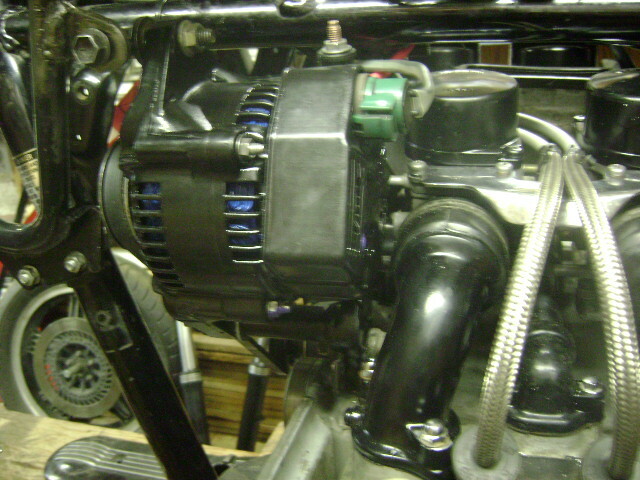 This conversion is designed to use a specific alternator,others may work. I found mine at the auto wreckers after opening several hundred hoods. The winner is a Nippondenso unit from a 1988 Pontiac Firefly Turbo 1.0 liter . 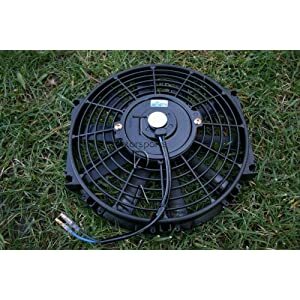 It measures 130mm or 5-1/8" from front of pulley to the rear of the unit and100mm or 4" in diameter. 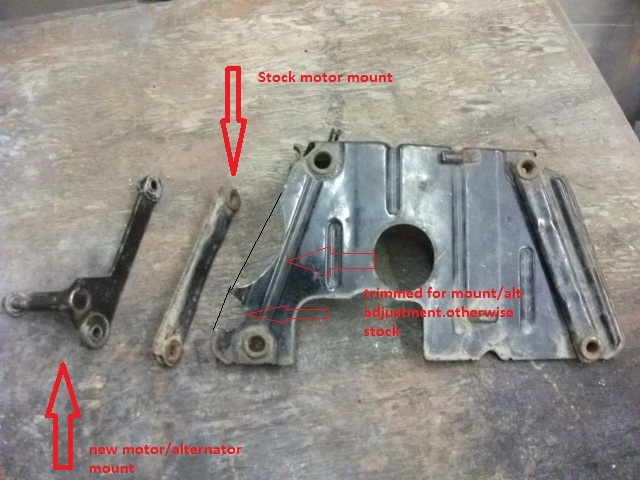 On the bottom of the unit the rear mounting foot is a stamped steel unit that can easily be unbolted and discarded. No cutting required like the Geo Metro Alternator. I paid $25 and had a shop rebuild it forabout $100 he even painted it satin black before assembling it ,cheaper than one from the auto parts store. 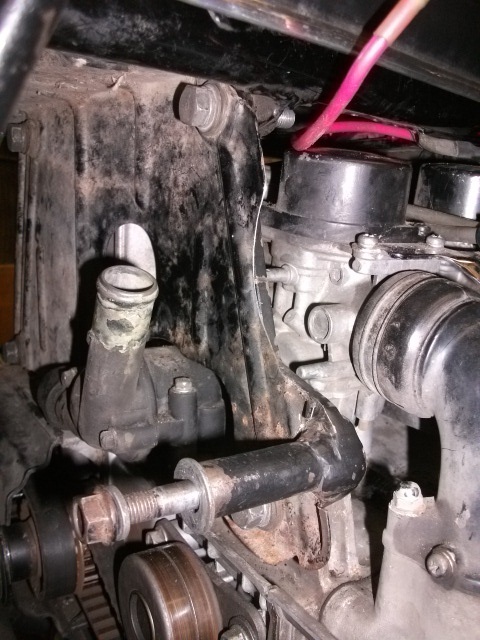 Pull the timing covers off and remove the crank bolt. Grind the grade stamp off the head of the bolt. Chuck the crank bolt in a 1/2" drill press,spin it fast to find the center by holding a 1/8" drill bit. Your not trying to drill the bolt yet just make a mark so you can turn it overand center punch the mark. Now use a 1/4" bit and drill the center punch mark about 3/4" deep.Make sure the bolt is square and plumb to the bit . Reinstall the crank bolt,reinstall the timing covers with rubber gaskets,but make a notch in the rubber where it passes over the crank bolt. Use a 1 3/8" bimetal hole saw to cut a hole in the timing covers,medium speed light pressure works for me.use cutting fluid if you have it. showing the 1-3/8" hole for the new pulley perfectly centered over the end of the crank. 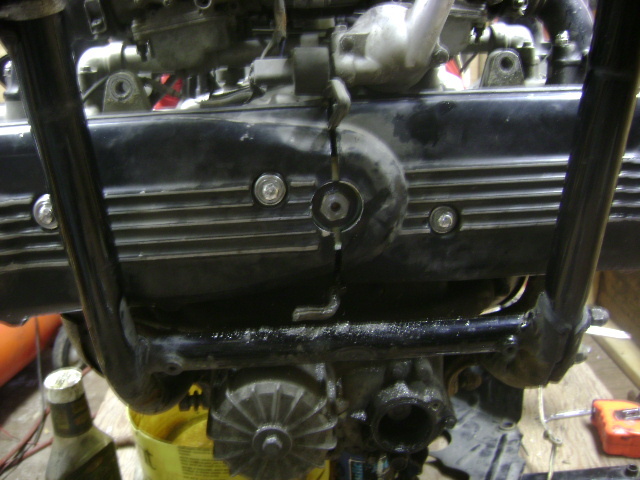 Notice the rubber gasket is split and pulled back out of the way for now. That should be enough work to reward your self with a nice frosty beverage. Now remove the covers and CLEAN up the mess you made. Metal chips (even aluminum)aren't good for the belts.Remove the drilled crank bolt and save it for when you help your buddy do his conversion. You will need to get a longer bolt to hold the new pulley .Same thread pitch but 55mm or 60mm long. I got mine free from the local Honda dealer. I was going to use the following drawing to have one made, but my machinist was too busy and I couldnt wait . I used a 2" pulley from another scrap alternator and bushed the center hole down to fit the 12mm X 60mm bolt.giving me a 1 to 1 drive ratio . 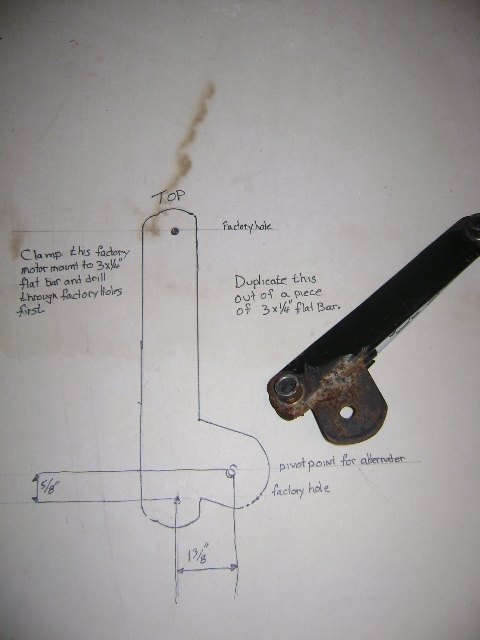 I would have prefered to use a 3-1/2" drive pulley but couldnt find one in time. 1 to 1 works fine but doesnt charge well under 1200RPM. I get 13.5 volts at 1300RPM. Here's how mine looks installed, hole in timing cover is 1.375",spacer behind pulley is 1.360"diameter. Nice close fit to help keep the road crap out.I opened my timing covers the other day to checkfor debris,Im happy to say that after 3500km./2300miles everything is clean as a whistle in there. Now thepart that took me the longest to get just right. when you strip the bike down to start this build you will come across the top motor mounts behind the tin heat shield in front of the carbs . That's 5/8" up and 1-3/8" over. now its time to fit things up and butcher the tin. New motor mount first then the heat shield tin. For the pivot bolt I used a 10mm X about 3-1/2". 3/8 will work but the 10mm bolt is a better fit. Iused the pivot bolt from the car I took the alternator from. Weld bolt head to new bracket,use a spacer and nut to pull the bolt tight and square to the bracket once you establish the proper length bolt. Do not use "Allthread" rod except for the mock up stage. Dont forget to unplug the voltage regulator,this can be plugged back in to use the stock system in case of an Alternator failure/belt breakage in the middle of nowhere. The fan shroud needs to be trimmed. To position the rad properly I spaced the bottom out 3/4".Longer bolts needed here.Use the same rad hose but rotate it slightly to get the best fit,leave hoses off for now. Modifying the fan motor support requires removing the rad andfan blade and fanmotor several times next photo shows the angle bracket I welded in after cutting out the support at the 8 o'clock position.Not the new bracket fits behind the new belt and uses the stock mounting bolt holes. I had to trim theleading edge of the fan itself a little the next photo shows how much I removed to clear the new belt. I cut them off using tin snips and smoothed them with sand paper. there seems to be no adverse effectson the ability of the fan to cool the engine. last bit of butchering to do..... The lower fairing mounts need to be cut like this and then reversed left for right because you have moved the rad bottom out 3/4". This mod solves that problem. trim them both to look like the one on the right of the photo.File smooth and paint black. Once you put it all back together you will notice that you dont have to modify the plastic at all.It does touch the alternator but only just. 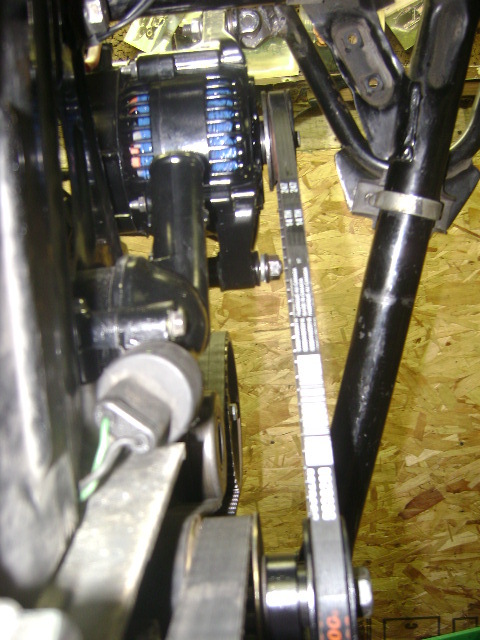 Wiring is simple There are only 2 wires I used,heavyguage from alternator output to inline blade type fuseholder and then to battery positive. I have a 40 amp fuse in mine so far it hasnt ever blown. Of the 2 wires coming out of the green plug in on the back of the alternator I used the one marked " I " or " IGN " to the ACC terminal on the fuse panel. Check your work and fire it up . You should have 13.5 volts just above idle and 14.5 above 2500RPM You now have 55amps of power to run LOTS of stuff. Feel free to use this info for yourself or to help out a friend. If you make some money off of it dont forget where you learned it from and make a donation to this forum. Just so I understand, the bottom of the alternator pivots on a tab from the motor mount, and the tension is from another tab welded to the fairing support? Is it adjustable for belt tension? I didn't see that piece very well? I mean the tensioner? You used a bushing for the pulley you took off? There is no keyway, then? Will it not slip? 1980 Standard : Pacifico fairing : Vetter trunk. 1987 Aspencade : Fully dressed. 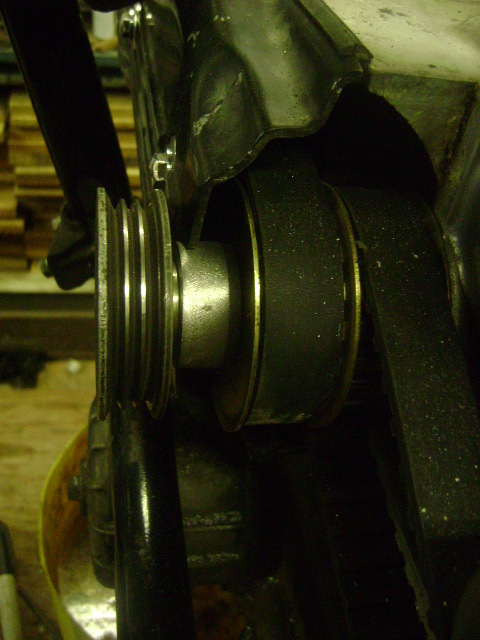 the tensioner is a bolt that you tighten to increase the pull out on the top ,weld a nut on edge to the top of the bolt that you would normally tighten on the car. Thanks for the answers, I see what you mean now. Sure does look good! This a great write up Thanks for shareing. This will more than likely help some folks. That's great! Now that unlimited power is available, I wonder if it might be worth replacing the fan with a modern automotive fan, that's thin and won't have to be modified - and will move more air than the original? Something like this? One observation, that's the leading edge of the fan blades you trimmed, not the trailing edge. Otherwise a good writeup.